Synechron, a global consulting and technology innovator in the financial services industry, today announced the acquisition of Hatstand, a global financial services consultancy and capital markets specialist. This acquisition further builds Synechron’s consulting capabilities for world-leading financial institutions in key areas such as cybersecurity, market data and risk and regulatory compliance. Synechron is focused on creating the financial services industry’s leading consulting and technology organization; an organization that is able to define and deliver solutions that address the most vexing business challenges brought about by a wave of new technologies. Synechron is helping global financial firms leverage innovations such as artificial intelligence, blockchain and digital. Hatstand’s capabilities bolster this vision by deepening Synechron’s existing consultancy services while adding data management expertise. Through a shared passion for innovation and a client-centric approach, the combined business proposition will offer financial services organizations access to expert, end-to-end solutions, delivered at scale in an agile and cost-effective manner. 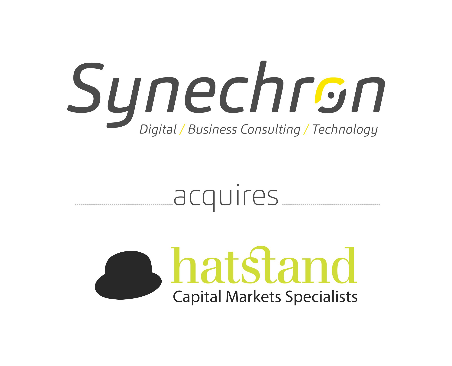 Adam Bennett, President and Executive Chairman of Hatstand, said of the acquisition, "We share the same vision as Synechron, in terms of delivering the highest quality service and investing in our people. This move represents a natural next step in our continued growth, and we are looking forward to being able to offer our clients extended capabilities and reach."